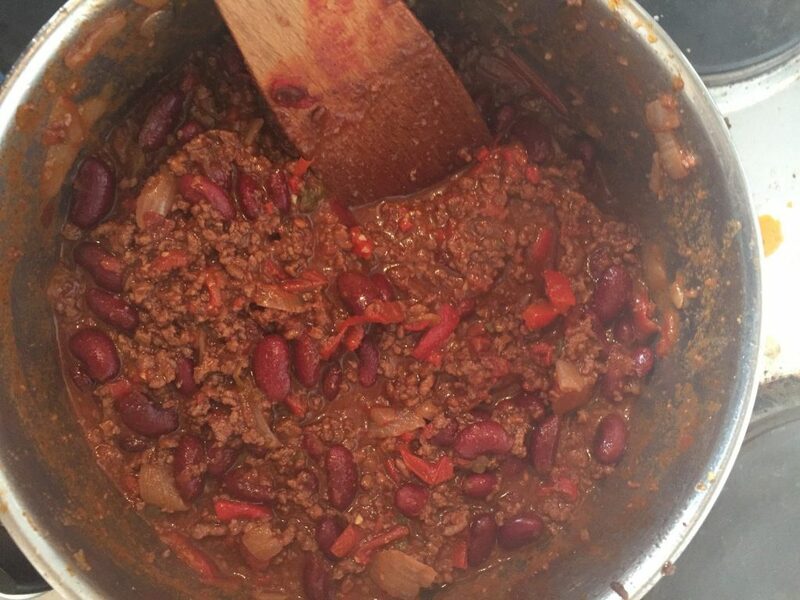 I’ve blogged a chilli recipe before. But, it was at the start of my blogging journey, which invariably means it was awful! As I was making one today, I thought this was a good time to re-do it. Isn’t it amazing when you look back at your first posts, how far you’ve come? I was struck by how little I knew and how basic it was. But, at the time I expected people to read it (they didn’t. Why would they?). Chilli used to be my go-to meal. I’d make it if I was having anyone around for dinner, and me and The Boy ate it regularly. It’s great, because it doesn’t take much effort, gets better after a night in the fridge, and freezes well. I like my meals to be quite simple and don’t like to use too many different flavours. Not chilli though. If I don’t have one of these ingredients in, it will still work, but it won’t be quite the same. The flavours just all work perfectly together. But, don’t be alarmed by the giant list. It is just a case of throwing them all into a big pan. Lots of ingredients, but a straightforward recipe. This is probably the longest list of anything I make. But, I promise it’s incredibly simple. 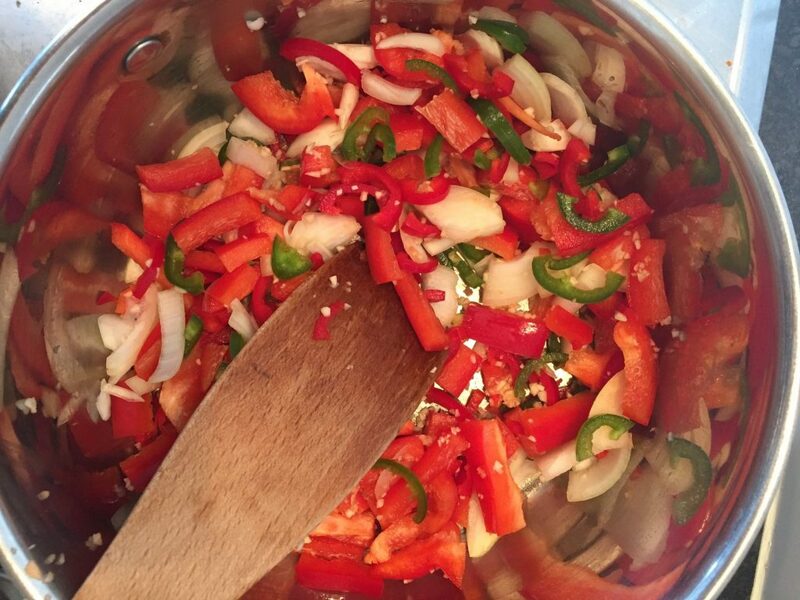 Firstly, finely chop the onion, garlic, pepper, and chillies, removing any seeds. I like to use 2 red chillies, but it annoys me that to do this you have to buy them separately, as the packs always have 1 red and 2 green. So, today I’ve used one of each. It also annoys me that packs of peppers often have more green. No one likes the green ones, just like fruit pastels! Red and yellow all the way. Add these to a large saucepan, with a little cooking oil. I’m currently using a fry light spray. Thanks to the lies of the Wii fit board. Cook for a few minutes, until softened. 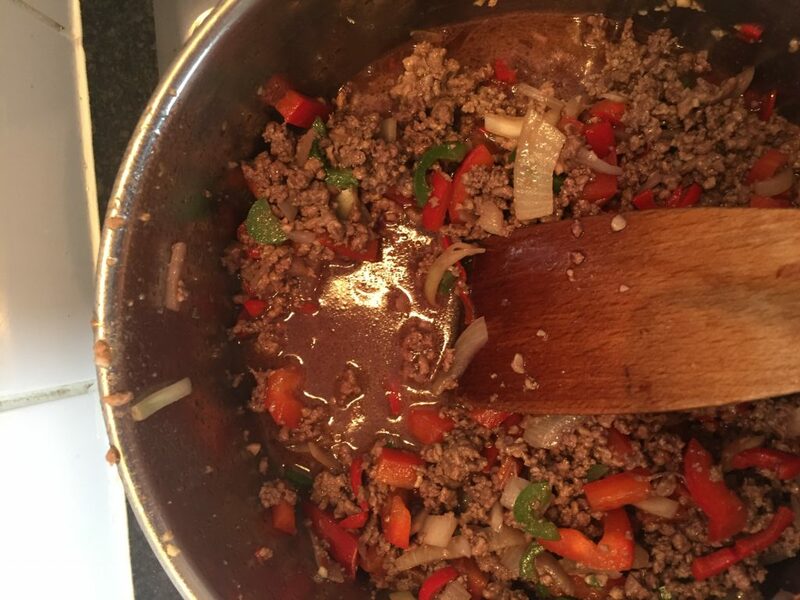 Then add the mince. Fry quickly until browned. I drain some of the oil here. Add the red wine, bring to the boil and leave for around 3 minutes. Next, add everything but the kidney beans, and stir together well. Bring back to the boil if you need to, and reduce to a simmer. Leave to cook one hour, stirring occasionally. After an hour, drain, and add the kidney beans. Mix well and leave to simmer for at least 30 minutes. I have been known to leave it for hours. It tastes better the longer you can leave it, but don’t forget to stir as it will stick to the bottom of your pan if left entirely. If it starts to get too dry, add a little water, and stir. It will thicken again in time. Taste it, and add more chilli powder if desired, or some chilli flakes if you want a real kick. Serve with rice and sour cream. 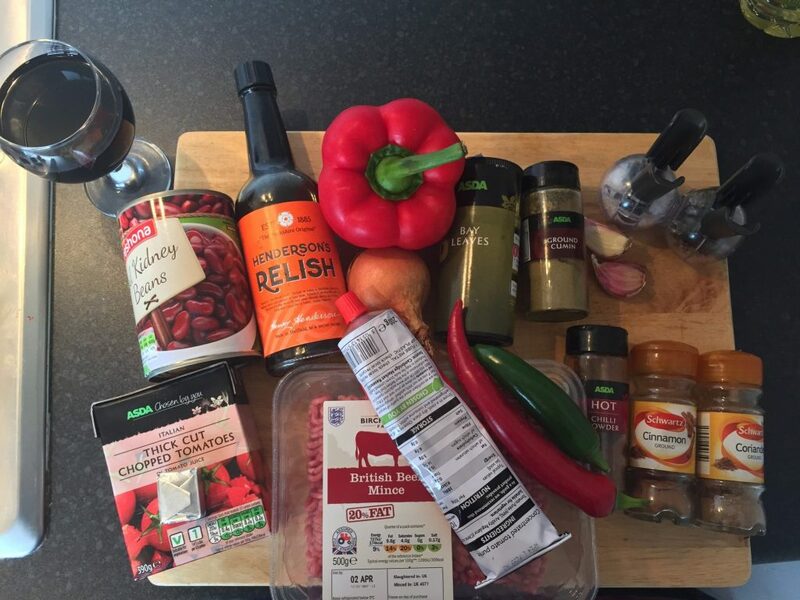 Chilli Con Carne is a perfect, filling family dinner!